So I’ve just this afternoon come back from my road trip around Scotland and I thought I’d share one of the more interesting experiences I encountered along the way. I flew into Edinburgh on the 3rd of March, and was completely blown away by its sheer beauty. I didn’t know much at all about the place before my visit, so after checking into the backpackers hostel (directly opposite the magnificent Edinburgh Castle) I hopped onto a tourist bus and took the hour-long journey around the city, listening into the highly entertaining and interesting commentary provided along the way as we passed the local sights. I was especially intrigued to hear about Edinburgh’s bleak past, in particular the townspeoples fascination with public executions over centuries gone by, and also the crime, disease and harsh environment associated with the industrial revolution. As the bus drove past South Bridge we were given a glimpse into the history behind the 19 archways built back in 1785. Apparently there were hidden, haunted vaults built deep inside the bridge, a few rooms of which were actually accessible to the public on one of the many ghost tours conducted throughout the city. So naturally curiosity got the better of me and I went on one of these tours to see the vaults for myself. Join us if you dare! This is a no holds barred, adult only tour. We will take you on a journey through the streets of old Edinburgh. It will be dark and dingy and you can imagine for yourselves how the characters of old stalked these very alleys, doing unspeakable deeds and leaving a grisly legacy behind. Hear in every gory detail about the persecution of the witches during the 1600’s and how the plague caused a slow and agonising death. Then, only if you’re ready, enter our underground vaults, home of the South Bridge poltergeist! Our guide Luke arrived wearing a trenchcoat and carrying a walking stick, and he took us on the initial walk around the cold, dark alleyways. He explained along the way how the booming population of ye olde Edinburgh, mixed with the burden of a man-made wall around its outskirts, meant that the only way people could be housed was to build the city upwards. Of course, structural engineering was not at the standard that it is today, so it came to happen that the timber floors built above the one-story stone buildings eventually collapsed, killing a great many people and rendering the survivors homeless. In time to come, the governing body of the city conveniently declared that all homelessness be illegal, punishable by execution. Those who didn’t want to face a beheading had no other choice but to live underground in the dirty, decrepit South Bridge vaults. Into the vaults we headed. We were situated within a long, wide corridor, with three rooms built into the left hand side. The first room was a room that is actually still in use today by a group of local Wiccans who perform magick rituals on a regular basis. It was closed to public use, but you could see its full Wiccan setup in the dim light with its pentagram and wands hanging on the wall, and a stone circle in the centre. The second room, we were told, was the most haunted of the three rooms according to the many spiritualists who have studied the vaults. This is where the famed poltergeist was supposed to have resided; a single entity consisting of the souls of those who passed away from the trecherous, disease-ridden conditions of years gone by. However it was the third room towards the end of the corridor that interested me the most. The Wiccans had actually chosen this particular room as their original venue for performing their rituals. They had it set up in a style much similar to that of the first room we encountered, with the pentagram and stone circle, however all that remained today were the stones, encircling a few cold puddles of water that had dripped down from the ceiling above. We were told that not long after the Wiccans commenced using this room, some very strange things started to happen. For example, objects within the room would move. The temperature would suddenly drop, then rise back up again. The water dripping from the ceiling would only drip within the circle itself, and never form puddles on the outside. People started feeling strange sensations, as if they were being held back or choked. It was clear that the room was possessed by a highly negative energy. Eventually the leader of the Wiccan group decided to camp overnight within the circle, intending to perform some healing rituals in an attempt to ward away this unaccommodating, disturbing spirit. The night began without trouble, however it wasn’t long before the entity made itself apparent, and the Wiccan leader soon realised that he was fighting against something way beyond his own capabilities. After experiencing an agonizing discomfort and noticing scratches appear over his body, he fled the room and vowed never to set foot in it again. Among other horrendous occurrences, it was in this room over two centuries ago, that a notorious criminal murdered at least sixteen prostitutes. It is said that the entity haunting this room is made up of the demonic remnants of these poor women. At the conclusion of the story, Luke invited us to take a step inside the stone circle and experience the energy for ourselves, if we so dared. We were all gathered around the outside of the stones, and it was plain to see the effects of the storytelling had caused quite a lot of unease within the group. Luke confessed that on many occasions he has witnessed members of his tour groups either faint or begin losing their breath upon entering the circle, but that didn’t stop two girls from our group bravely taking a step inside. I followed. I have no fear. We had a quick hug in the middle, before stepping back out and confirming that we were all in fact ok. Nothing out of the ordinary happened, and neither of us felt any form of discomfort. We continued on with our tour, which concluded soon after in a pub where we all had a drink and eventually parted ways. Now it’s completely understandable at this stage if you think the whole experience of being in a so-called “haunted” environment is a good example of human psychology accentuated by the theatrics of a few hair-raising tales about ghosts. But I haven’t finished my story yet! It was well past midnight by the time I got back to my hostel room after the tour, so I got changed, went to bed, and had a nice peaceful sleep after a long day. I woke up fairly early in the morning, around 7:30-ish, and did the usual stretch and yawn thing that you do to encourage yourself to get out of bed. I scratched my head, wiped my eyes, and rubbed my hands down my face. It was then that I noticed blood on my hands. I had a bleeding nose. I’ve not had a bleeding nose since I was about nine years old. You can draw your own conclusions on this one my friends, but in my mind this was no coincidence. This was the work of a troubled soul, giving me a warning for wrongly and selfishly entering its territory. This is the one and only photo I managed to take within the vaults.  Unfortunately it was pitch black, but you can just make out an artefact and a few crosses on the rear wall. This entry was posted on Thursday, March 12th, 2009 at 3:12 pm	and is filed under Blog, Ghosts, Scotland, Travel. You can follow any responses to this entry through the RSS 2.0 feed. You can leave a response, or trackback from your own site. Amazing story! I too went into the vaults but my friend was the brave soul to step into the circle. After he stepped out of the circle of rocks, he has four slashes on his left arm and started bleeding. i can see the artifact and other things pretty cool if you think about that. I was asked if I wanted to enter the stone circle. I had the strongest of all feelings/warning that I should stay out. I physically could not go near the circle either. I felt uncomfortable the whole time in there. It was the room at the end in which I felt the strongest presence though. Our host did not say anything other than some women don’t feel comfortable in here. I was okay first, then all of a sudden I felt/heard whispering next to me. I felt an overwhelming sense of terror. Not exactly for myself….. but that I was feeling the feelings of someone else. I have never felt terror like that before. I felt someone’s utter and absolute fear like unlike any I had experienced. It overtook me completely. I had to ask to leave the room. We all stood just outside the entrance. Just a few steps and I felt ok. But still aware of a presence there. I was asked what happened, and after describing it, my host said sometimes the form of a little girl in a red dress appears there. This was not what I felt though. Something communicated to me its feelings of utter fear of another entity. I was feeling like a feeling of suffocation and intimidation. I found all of these stories very interesting. My story is somewhat lengthy but still true. It was October 2016 and I so badly wanted to visit the vaults. I have previously visited Scotland before but did not tour any haunted sights even though I wanted to. The tour started later in the evening so I left my husband in the hotel and I ventured off by myself to the vaults. The craziness starts in the vault with the stone circle, it was damp in there and water was regularly dripping on my head a face, I really didn’t think anything about this although no-one in the group had the experience. I always am that one person who likes to stand in the darkest corner alone, or allows someone to lock me in the closet. This time it all turned out different for me. I was the last to leave the vault and OF COURSE HAD to stand in the circle, after all that’s the crazy things I do, I didn’t feel anything in the circle but upon exiting the vault I IMMEDIATELY began to get dizzy, standing in the direct next vault listening to the next story I began to sway, I felt very off balance, my knees were literally about to buckle, I felt like I was going to start crying, (I mean not a whimper cry, I mean a hysterical bawl). I walked back to the hotel for we are leaving bright and early that morning. We were leaving from Manchester and I felt a cold heaviness in my lungs and even mentioned it to my husband. We arrived home the next day and at 3:00 am I found myself in the emergency room of the hospital. I had a pulmonary embolism, not just a regular pulmonary Embolism but a rare type where part of your lung dies, and not only that they had to drain 2 liters of blood off my lung as well. Doctors say the cause was because of the airplane ride. I must say I have traveled to Eygpt, Italy, Greece, Africa, Germany, ETC. In other words I have been on much longer flights. It was very ironic to a very healthy me for this to happen after standing in the circle. Another REALLY weird thing is two of my sensitive friends have basically stop talking to me, claiming there are iron shackles around my left foot and there is an ancient entity attached to me. What the hell? Crazy story I know! Coincidence or not, I have no idea? Hey, total shot in the dark, but do you happen to know how to contact the Wiccans practicing down in the Vaults? I’m doing a research project for a college class based on family member’s paranormal experience on this tour. I really need to someone who knows about the rituals that took place in the stone circle vault. It has been difficult to find any solid info. My son visited the vaults over the new year week and stopped with us traveling back. The next morning when he came down stairs I could see he wasn’t himself. I asked did he sleep ok and when he turned to reply I noticed three deep scratches down his neck he had no idea where they came from. He then burst into tears and began to tell us about a girl called Emily who he appeared at the end of his bed she came towards him and he felt she entered his body.HE tried to wake his girlfriend but was totally unable to move. Then his head started shaking side to side . At the point he was able to shout the name Emily out which woke his girlfriend. Speaking to her she said his voice wasn’t his. He has been deeply affected by this,I wish he hadn’t entered that circle.